Where we treat you as a guest not as a tourist. Join us on a journey of a lifetime to Co. Clare located on the beautiful West coast of Ireland. Or relax and unwind in one of our Irish inns, restaurants and pubs along Wisconsin’s Eastern shore. Call (920) 362-6393 or Email Mandy for More Tour Information. Join us on a journey of a lifetime to County Clare located on the beautiful west coast of Ireland. Relax and unwind in any Harp & Eagle Irish inn, restaurant and pub located along Wisconsin’s Eastern shore. 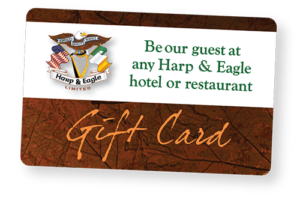 Harp & Eagle Gift Cards can be used at any Harp & Eagle hotel, pub or restaurant. Securely purchase online here!